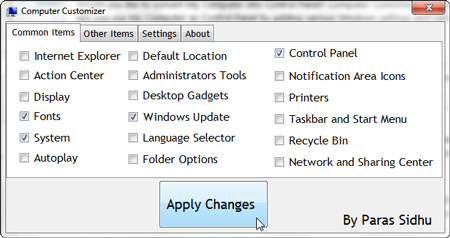 Windows provide many tweaks and customizations by default. But to access these settings or perform various other tasks we have to visit a lot of places or locations hence wasting a bit time. If you want to add useful places and options to My Computer for easy access then Computer Customizer is a small for your convenience. Computer Customizer is a windows freeware utility to add items to My Computer. It is easy to use with a single window tabbed interface. It provides lots of items categorized under two tabs. To add any item of your choice, you have to select the items from the given menu. Multiple items from both the tabs can be selected at once before applying the settings. Once the settings are applied, you do not require to log off or restart system to make the changes appear. Just go to My Computer and you will find the additional items beneath the regular items already present. Thanks bud, that’s helpful info. I always enjoy increasing performance and organizing better my computer. It always needs more.